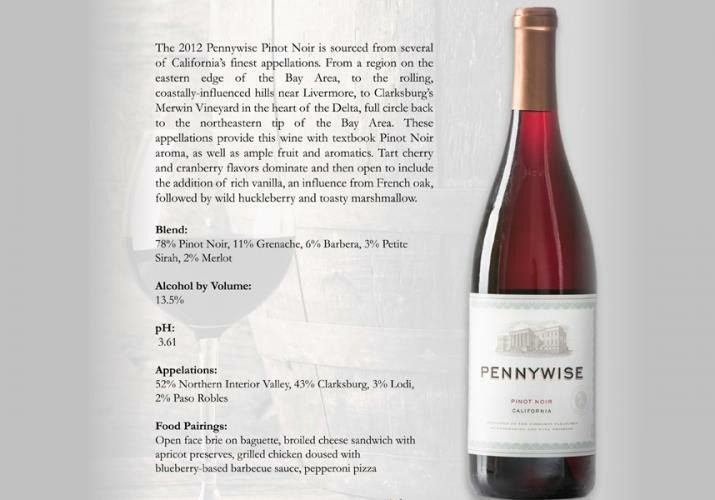 The 2012 Pennywise Pinot Noir is sourced from several of California's finest appellations. From a region on the eastern edge of the Bay Area, to the rolling, coastally-influenced hills near Livermore, to Clarksburg's Merwin Vineyard in the heart of the Delta, full circle back to the northeastern tip of the Bay Area. These appellations provide this wine with textbook Pinot Noir aroma, as well as ample fruit and aromatics. Tart cherry and cranberry flavors dominate and then open to include the addition of rich vanilla, an influence from French oak, followed by wild huckleberry and toasty marshmallow.